The lacy freeform 3D printed heart is more than something pretty to look at. “The principal application of these freeform printed objects is as sacrificial templates,” said Matthew Gelber, a Ph.D. candidate in bioengineering and a member of the Bioimaging Science and Technology Group. The delicate, red lacy 3D heart, posed next to a green gummy bear, is more than just a cute desk ornament or charming conversation piece. 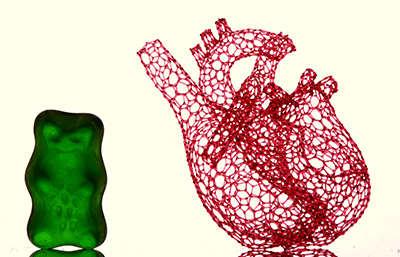 “Freeform 3D-Printed Heart Scaffold with Gummy Bear,” by Matthew Gelber, working in the Bhargava Laboratory, was a finalist in the 2016 Science Image Challenge hosted by the School of Chemical Sciences. The macrophotograph shows a vascular template composed of 4,637 filaments, each individually "drawn" by a nozzle translated in 3D space. Gummy bear shown for scale. Sure, the image of the duo, titled “Freeform 3D-Printed Heart Scaffold with Gummy Bear,” was a finalist in the 2016 Science Image Challenge hosted by the School of Chemical Sciences, but the 3D structure makes more than just a pretty picture. The items are printed with the sugar substitute, Isomalt, which is water soluble and biocompatible. 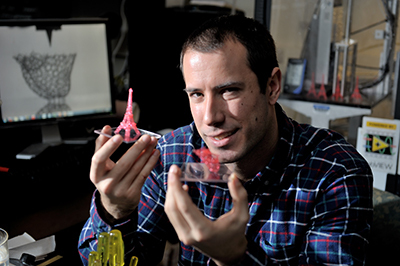 Matthew Gelber, a Ph.D. candidate in bioengineering and a member of the Bioimaging Science and Technology Group, is shown with two of his freeform 3D-printed models. The Eiffel Tower on the left took 12 hours to print, while the heart took roughly 8 hours to print. The sugary channels and the surrounding medium can be seeded with cells to create an accurate model of the breast ducts, for example, which is useful for in vitro studies of breast cancer. This technique also can be applied to make a variety of devices, from stents to monolithic microfluidic chips, which can perform chemistry at a very small scale. It also is scalable for applications ranging from millimeter-scale organs-on-chips to centimeter-scale vascularized tissues. Gelber works under the supervision of Rohit Bhargava, a full-time faculty member at the Beckman Institute. “This printer opens up a world of possibilities in fine control over structures in biomedical sciences,” said Bhargava, who heads the Chemical Imaging and Structures Laboratory and directs the campus cancer effort. The Bhargava Lab will use the printer to develop reactor systems to understand tumor-microenvironment interactions that drive cancer progression. Gelber earned his bachelor’s in general engineering at Illinois and returned to campus to build the 3D bio-printer in Bhargava’s laboratory where he was an undergraduate researcher. The development of the printer was funded through a Beckman Institute Seed Grant, which is supported by the Beckman Foundation. In freeform 3D printing, a moving nozzle is used to "draw" lines. This technique is different from layer-by-layer 3D printing and requires unique hardware, software, and materials. Gelber built the printer, programmed the software, and is now working with Greg Hurst, a developer at Wolfram Research, to fine-tune the implementation of the algorithm that determines the order in which the lines are drawn. And patience is important in 3D printing. The 3D heart is 35 mm tall and took roughly 8 hours to print. The intricate Eiffel Tower, shown in his photograph, took 12 hours to print.